England’s Dylan Hartley and Maro Itoje look dejected after conceding the second try. Ireland have emerged as the dominant force in the northern hemisphere after sweeping all before them in the 2018 NatWest 6 Nations. Here, Press Association Sport examines five things we learned from the tournament. Before the competition began the focus was on England's search for an unprecedented third successive title as they looked to narrow the gap on New Zealand. Fast forward seven weeks and it is Grand Slam-winning Ireland who have emerged as the biggest threat to the All Blacks supremacy at the 2019 World Cup. The chief hallmarks of Irish success have been efficiency, accuracy and clarity of purpose. All three stem from the genius of their Kiwi head coach Joe Schmidt, whose contract expires after Japan 2019. With Steve Hansen's reign as New Zealand boss likely to draw to a close at the same juncture, the stars are aligning above Schmidt's quest to take over the All Blacks. 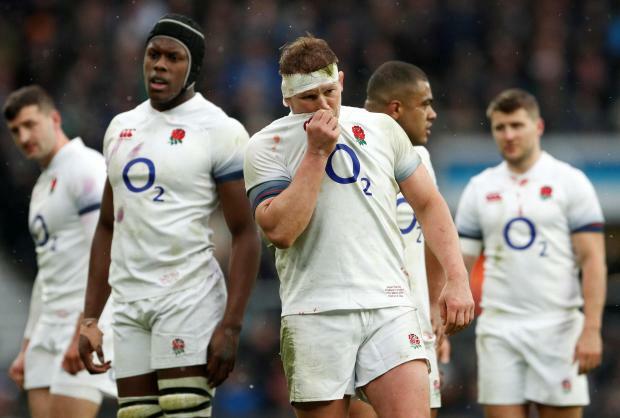 Eddie Jones argues to the contrary, but England have lapsed into crisis following a third successive defeat that leaves them stationed above only Italy and completes their worst Championship performance since 1987. It is a rate of decline that was unthinkable as recently as early February when the Azzurri were overwhelmed in Rome. Supplying the largest contingent to the previous year's British and Irish Lions tour has had its customary impact, but the deficiencies extend far beyond fatigue to encompass leadership, attack and an overall lack of purpose. Billy Vunipola's stock has risen with each defeat and the importance of the giant Saracens number eight to England's cause has never been clearer. A fractured arm is the latest ailment to have robbed the fallen champions of their most destructive player and he will be welcomed back with open arms for the summer tour to South Africa. In his absence England have missed a rallying point in the forwards who is an outstanding carrier, good over the ball and brutal in defence. Aside from England's plummeting fortunes, northern hemisphere rugby is evidently operating from a position of strength. Ireland have been magnificent and there has also been much for Wales to take from their runners-up finish secured in the face of a dreadful injury crisis, Warren Gatland discovering that genuine depth is available to him. Scotland have shown flashes of brilliance but must address their shortcomings on the road and there are pleasing signs of a genuine French revival.